Recent DNA typing methods (RFLP, STR, RAPD; e.g. ) do not allow discrimination of monocygotic twins. To overcome this restriction, we suggest the use of variable DNA sequences of bone-marrow derived memory B lymphocytes that are likely to be different even in monocygotic twins. Since memory B cells are transported in the blood stream, they can be found in blood stains on crime scenes and checked for a match to the cells of a living pair of twins. The size of the antibody repertoire has been estimated to comprise theoretically up to 1010 specificities . Since each B lymphocyte is endowed with a single antibody specificity, this estimate corresponds to the number of different B cells that can be generated. A major source of antibody diversity in the preimmune repertoire is the stochastic recombination of V, D, and J elements of the immunoglobulin heavy (IgH) chain locus. It takes place in B cell precursors in the bone marrow, and it results in the generation of genes encoding immunoglobulin heavy chains [1,4]. Apart from random selection of V, D, and J elements, diversity is increased by the random addition of non-germline encoded nucleotides (N sequences) and the addition of nucleotides palindromic to the termini of rearranging gene segments (P nucleotides) resulting in extremely diverse stretches of approximately 45 bp. These stretches should be specific markers to aid forensic differentiation between monocygotic twins because, due to their extreme diversity, they are highly unlikely to be shared by two individuals in the subset of B cells that forms the population of memory cells. Upon stimulation by an antigen, specific B cells are activated. In the germinal centers (in secondary lymphoid organs like spleen, lymph nodes, Peyer's Patches) they proliferate and differentiate into antibody secreting plasma cells and memory cells . At the same time, further diversity is generated by the introduction of point mutations into Ig genes (somatic hypermutation; ). 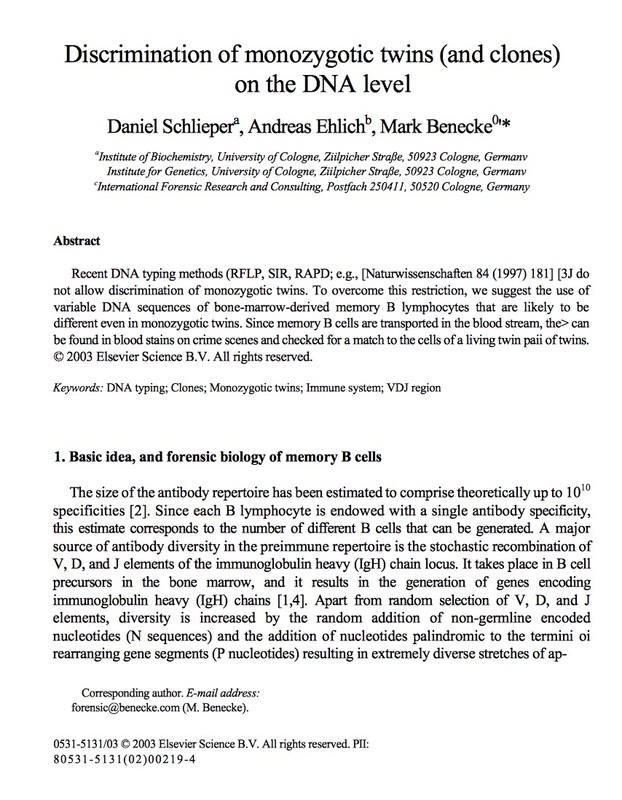 In contrast to naïve, antigen inexperienced B cells, memory cells are clonal. They are long-lived cells  and can provide immunity to the specific antigen for decades. Even if two individuals will have undergone an immune response to the same antigen, the pools of memory cells generated are likely to differ due to the variability in naïve B cells that are recruited into the response. This means that from a statistical standpoint, it is unlikely that monocygotic twins will share a majority of identical VDJ stretches in memory B cells. VDJ genes from B lymphocytes in a blood stain can be isolated by PCR and sequenced. Sequences that are derived from memory B cells can be identified by the presence of somatic hypermutations. The PCR primers used are specific for sequences downstream of J and inside of V elements, respectively. This will result in amplification of VDJ regions of all B cells in a given sample. 25% of all amplificates are expected to represent VDJ sequences from memory cells (e.g., [6,7]). The forensic question to be asked in a case involving monocygotic twins would be: In whom of both twins are memory B cells (i.e. specific VDJ combinations) present that are identical to the ones found in a given stain? Technically, native blood samples of both twins would be taken, and memory B cells would be isolated by fluorescence-activated cell sorting . Then, possible VDJ sequences matching the stain-derived ones would be detected by PCR using primers specific for the sequences in question. If a specific VDJ sequence of one of the twins’ blood cells matches a VDJ sequence in a stain, a possible match is established. Due to the high variance in specific VDJ sequences, false positives are unlikely. On the other hand, false negatives are possible, as the lack of a specific VDJ sequence in one individual might not exclude this individual: Depending on the size of the memory B cell clone no cell of a given type might be found in an actual sample of native blood. The data needed to calculate the probabilities for the exclusion of the matched twin and for the inclusion of the other twin are not yet fully available. In particular, comprehensive statistical data concerning the diversity of the available B cell repertoire and on the size of memory clones in humans have still to be established. In any case, an important piece of circumstantial evidence might be obtained by our investigation method. NOTE: Apart from the potential use for forensic purposes, the method described here can also be applied to distinguish individuals within a population of animals, e.g. sheep or cattle. This might be inbred lines, twins, or clones.